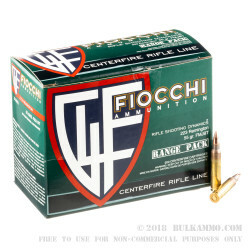 This 223 Rem cartridge by Fiocchi is from the Italian manufacturer’s Shooting Dynamics line of ammunition, an affordable but nonetheless high performing means of sharpening your marksmanship all day long at the range. 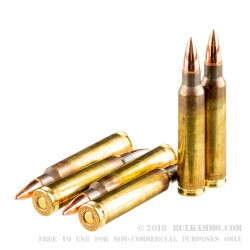 The cartridge is capped with a 55 grain projectile, by far the commonest bullet weight you’re going to find in its caliber. This bullet has a boat tail design, and its tapered base enhances its ballistic coefficient in order to flatten its trajectory, help it retain greater velocity downrange, and let it better shrug off the influence of cross winds. 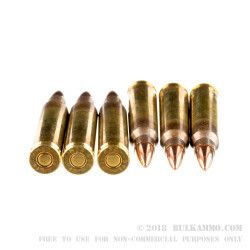 Its hard full metal jacket projectile will let this round function positively in your AR-15, and stave off nasty bore fouling as well. 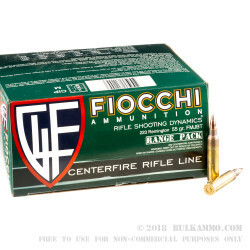 Fiocchi was founded 1876, and in their considerable time doing business they’ve mastered the arts of component manufacturing and quality assurance. This round’s brass casing is so precisely formed that you’d need scientific equipment to find any minute flaw in it, so it ejects and feeds as smooth as syrup and can be reloaded several times. Each of these rounds create virtually identical chamber pressures to one another, and their primers guarantee a perfect shot every time.